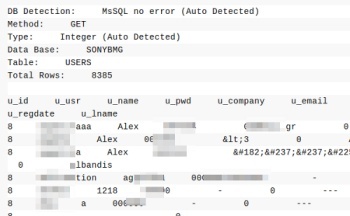 Another day, another attack against Sony, this time Sony BMG in Greece, which coughed up part of its user database to hackers over the weekend. It's nowhere near as jaw-dropping a breach as the attack that took the PlayStation Network offline for more than a month but the attack on Sony BMG in Greece is nonetheless proof that people somewhere still have it in for Sony, or at the very least think this bandwagon is still worth jumping on for some reason. The Naked Security blog says the nature of the attack suggests the hackers responsible may not have been particularly skillful but they were nonetheless able to get their hands on a user database containing user names, real names and email addresses of people registered at Sonymusic.gr. The hackers provided the user database to The Hacker News website, which posted it to pastebin.org, although the entry has apparently since been deleted. Fortunately for Sony BMG users, the passwords, telephone numbers and other data it claims to include is either missing or "bogus," but all users of the site are nonetheless being advised to reset their passwords as a precaution. "It is nearly impossible to run a totally secure web presence, especially when you are the size of Sony," the Naked Security blog says. "As long as it is popular within the hacker community to expose Sony's flaws, we are likely to continue seeing successful attacks against them." However, the blog also notes that the ongoing attacks could ultimately make Sony one of the most secure companies on the internet.